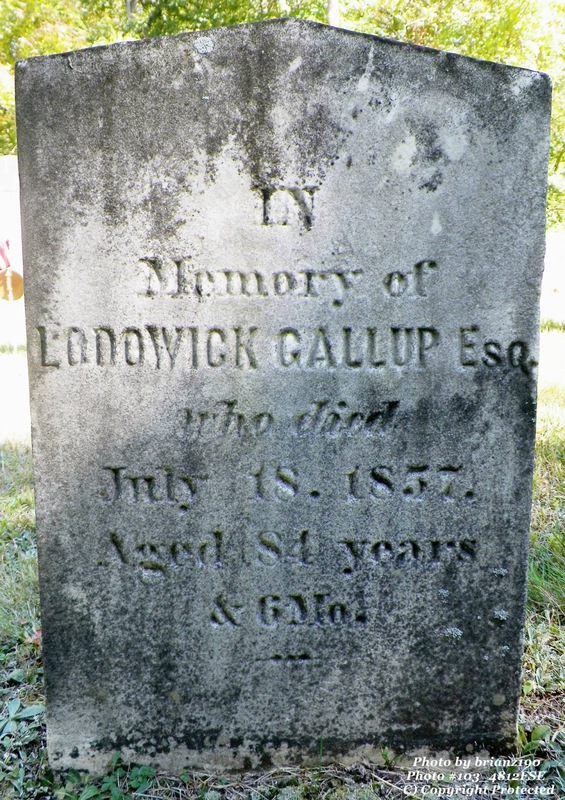 Lodowick GALLUP (Nathan, Benadam, Benadam, John, John) was born on 23 Jan 1773 in Ledyard to Col. Nathan Gallup and his wife Sarah Giddings in Ledyard, CT. (he was my first cousin, 7 times removed.) He was the last of nine children so it shouldn't be surprising that he and his wife were the parents of twelve. His wife was Margaret PHELPS and she is buried by his side as it is with most couples of this time period. He died on 18 July 1857 at 84 years and 6 months. In 1855, he wrote a will naming many of his living children by name. He probably was concerned for his property and belongings as his wife Peggy died in 1849 and as seen by the 1850 census, he still had children living with him. Like most of the Gallups living in Ledyard and Groton, he was a farmer.